Congrats! I had fun trying it out (emulator ntsc). My connection dropped while posting so i'm rewriting it here. I played four times in a row and got to 28.000 something. There's good room left for me to improve, so that's nice. I suspect it will be a little easier if i put it on powerpak and play it on my PAL unit. The run mechanism seems geared towards later levels. In so far as i got this time, it didn't see much use. I was thinking that there could be two run speeds, maybe accessed through pressing one or both buttons at the same time (keeping the press whichever aspect). One that is the current maximum and one that is somewhere inbetween, so you can gradually get used to running at different speeds. This is the sort of game that would've been perfect with the Vous, had that controller been commonly available. Is the red face/hands palette change intentional for this pre-compo file? The music speed up is great! I keep thinking it would have a little more psychological effect if it started att the level (x) title card screen. Kaboom clones would also work well with a Super NES Mouse. Too bad the Hori Track never made it stateside. I don't know what you mean. His face is pink...pretty much the same color used for like 90% of Caucasian NES characters. One technique, that will be useful, is...try to Tap the A (or B) button briefly. You'll get a short burst of speed, but then back to normal speed for better control at the point when you catch the pancake. Nice leg animation for the walk cycle there. The stools in the background seem huge though. Your floor tiles are decreasing in height (but not width), implying some type of stylized perspective, but the stools are nearly as tall as the runner, even without perspective. So, with the comparative floor tile size, they look pretty massive. Gameplay's smooth and fun, though. I dig it. Here's my score. Finally lost it at level 19. 1. I kinda wish the difficulty increased a bit faster. 2. Some of the pancakes the cook flips end up changing to syrup or butter in midair? Felt kinda weird to me that they're still visually lead by a pancake. 3. Pressing SELECT seems to select in 10 level increments. Is there a way to select any other levels, or do you have to start on a 10N+1 level? 4. Might be interesting if pancakes stuck to the stack where they land, instead of snapping to a perfect stack. An uneven stack might look interesting visually, though I think at that point you have to "control" the top of the stack instead of the bottom, so if you made a really diagonal stack the human at the bottom might end up offscreen at the edges. Nevermind, i forgot i had a really tinted palette loaded in from the rad racer 3D discussion. Uneven staples could be great. It introduces an element of careful handling beyond the either or condition. 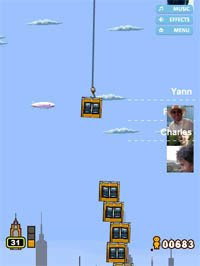 It was the best feature of this great mobile game; tower bloxx. You got rewarded with extra accumulative bonuses for every perfectly stacked block (and it would also sway differently depending on which side it tilted towards the most). I suppose it would lend a varying sense of relief once a stack is reset; as a side effect. The uneven-ness doesn't have to be 1:1 with how the pancake lands; just enough to signal to the player if the aim was off. The... great job you are awesome screen doesn't show your score. So... not sure what is was. Very near 150,000, but not sure if over or under. Lost on Level 29. Too bad. Wanted to see the Level 30 speed up, but it was only a first attempt. 13 is the new version that shows score on Game Over. Ah! Missed it because last post on page. Thanks everyone for the good suggestions. I'm currently working on the final boss of my ninja game, and I want to focus on that for a bit...so I don't know if I will have time to make any changes before the deadline...but...maybe I will port this game to SNES. It seems like an easy first project to try for SNES. 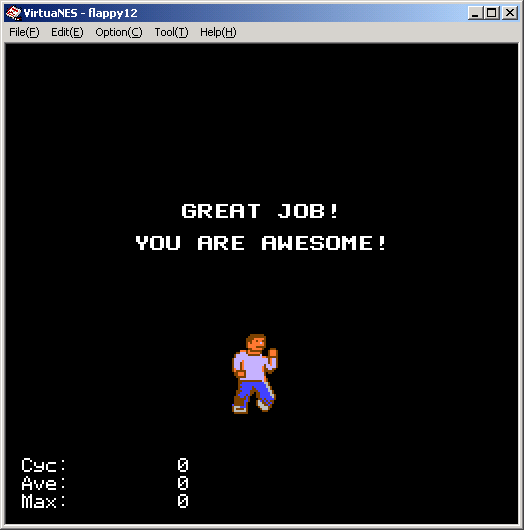 And, then, maybe I will make changes that didn't get into the NES version. Does this look better? I've made a bunch of tiny changes, but I'm mostly asking about the color of the floor. Someone said the screen was too monotone before (I agree). Changing the colours of the floor helped a lot, i think. Definitely better, imo. Besides being more colourful, it is also helping provide a sense of depth: the floor feels closer to the camera, and the bar is put in the rear end (an effect from having (1) colder colours that's (2) closer to each other in value, relative to the more vivid floor). It looks clearer. -pancakes caught off center will be placed 1 pixel to the left of right (does not apply to the first 4 pancakes...due to those being special, in order to reduce the sprite count, per scanline). I think I got to around level 30 on my first playthrough. Thanks for a fun game! Thanks. That's what I was going for. Or at least a game that someone would want to sell in a store.